SkyTruth analysts have found that since the beginning of 2011 there have been 2,067 new natural gas and oil wells drilled in the state of Pennsylvania, with the majority being Marcellus Shale gas wells. All of these wells are being hydraulically fractured (fracked). Data are updated daily from the Pennsylvania Department of Environmental Protection and accounts not only for wells already drilled, but also those soon to be drilled. As listed today, there are ten wells slated to be drilled between September 30 (tomorrow) and October 6, 2011. These listings bring the grand total to 2,077 drilled wells in the state so far this year. The tables below break this down by county. 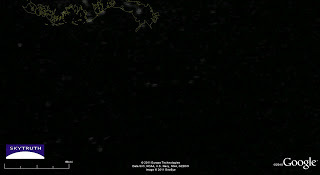 DMSP nighttime satellite image taken at 8:11 pm on September 25, 2011. DMSP image and data processing by NOAA’s National Geophysical Data Center. DMSP data collected by the US Air Force Weather Agency. Detail from 9/25/11 DMSP image above. Louisiana shoreline shown in yellow. 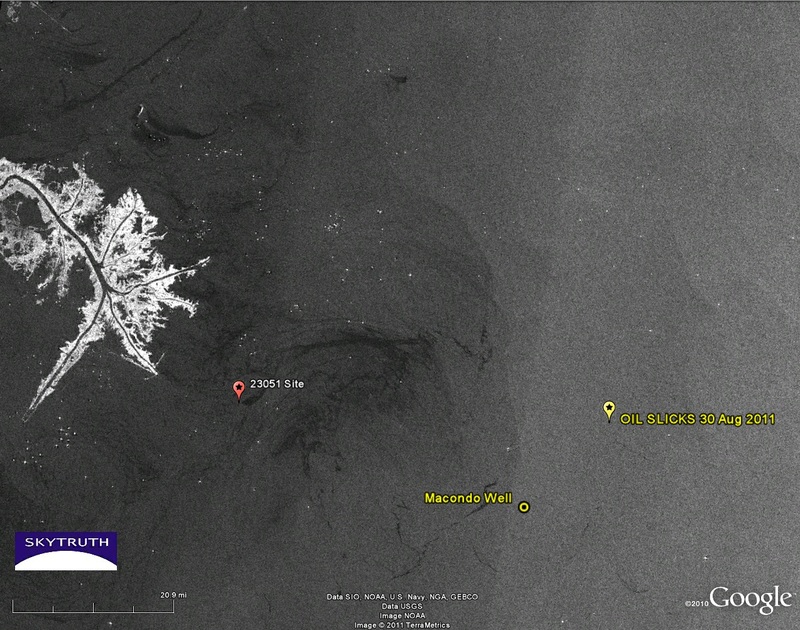 Detail from 9/25/11 DMSP image showing location of fire given in NRC report. 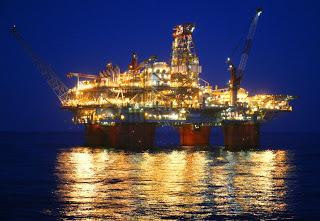 Two of BP’s large and well lit deepwater platforms, Atlantis and Thunder Horse, are shown for reference. 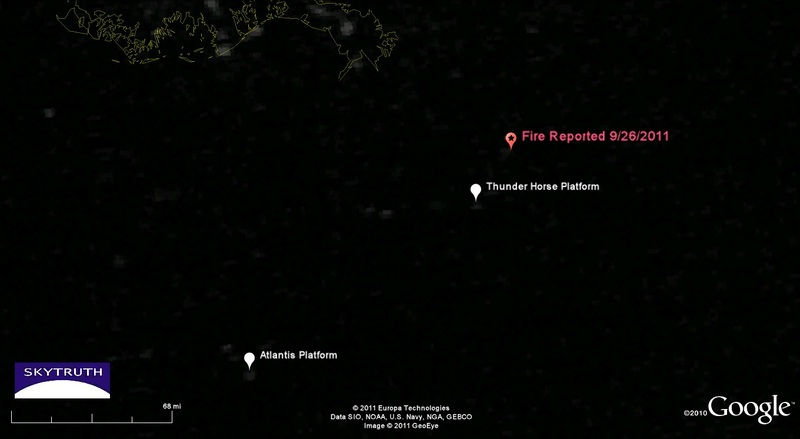 Thunder Horse platform at night. Image courtesy Oil Rig Photos. 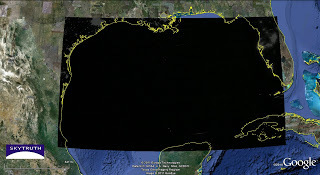 First – yesterday afternoon’s MODIS/Terra image was clear over the site of the reported fire in the Gulf of Mexico, and we don’t see any sign of a smoke plume like we did last summer when the Deepwater Horizon rig was burning. Possibilities: the report to the NRC was erroneous; the location in the report is not accurate; the fire was a short-lived event; the fire didn’t generate much smoke. A drill rig flaring off large volumes of natural gas could create a brightly visible light at night, and wouldn’t make much smoke, so we think this is a strong possibility. 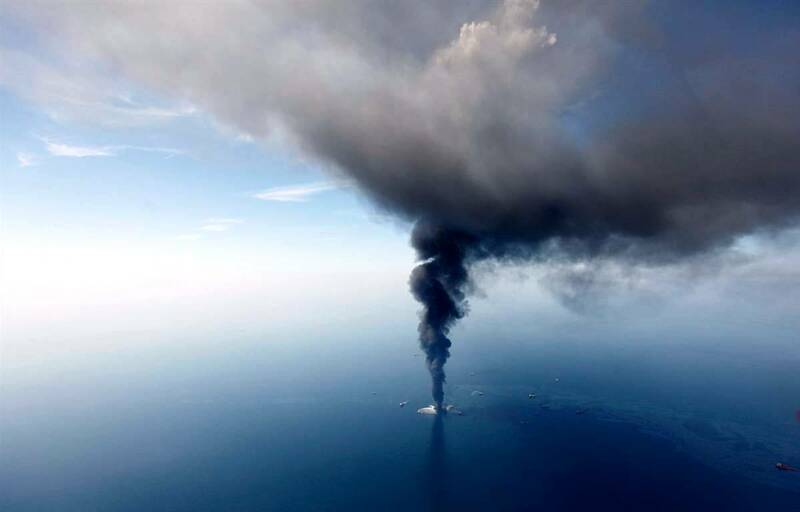 Flaring economic quantities of gas in the Gulf is illegal – Shell paid a $49 million fine in 2003 for violating that law. MODIS/Aqua satellite image taken September 26, 2011. 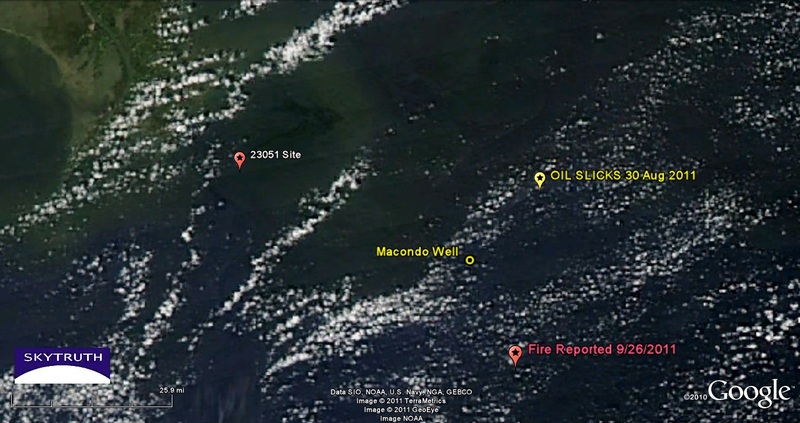 Second – the MODIS/Aqua image above, a couple of hours later, doesn’t show anything around the location of the fire either. Scattered clouds obscure the view there. But it does show a slick that appears to emanate from our old nemesis, the former platform 23051 site that has been leaking since 2004. 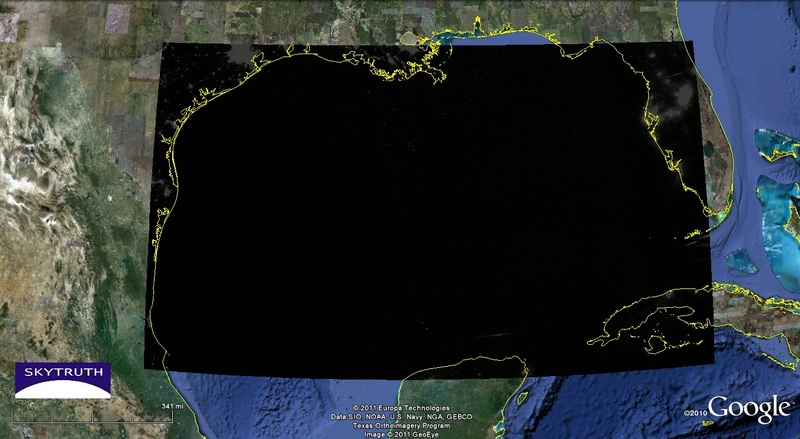 The apparent slick is about 20 miles long and covers about 115 square kilometers. Assuming an average thickness of 1 micron (1/1000th of a millimeter), that’s 30,705 gallons of oil. If this slick is at the lower limit of visible detection, 0.1 microns, it’s still 3,000 gallons – which is 3,000 times bigger than Taylor reported yesterday to the National Response Center just 30 minutes after this image was taken. 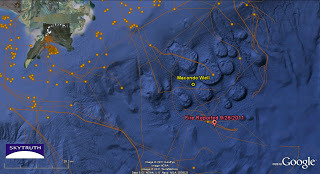 Detail from MODIS/Aqua image, September 26, 2011 showing apparent slick (delineated in yellow) emanating from 23051 site. This just caught our eye on the SkyTruth Alerts: multiple aircraft flying over the Gulf late last night reported seeing a fire about 60 miles southeast of the tip of the Mississippi Delta, in deep water about 20 miles south-southeast of BP’s failed Macondo well. The source of the fire is unknown, and to our knowledge this has not yet been verified, but the location given in the NRC report puts this in Mississippi Canyon Block 519, where wells have recently been drilled by Noble Energy and tied back to the massive “Na Kika” platform located in Block 474 a few miles to the northwest. A few small spills of hydraulic fluid have been reported in the vicinity in the past week so we know there is current activity in the area. 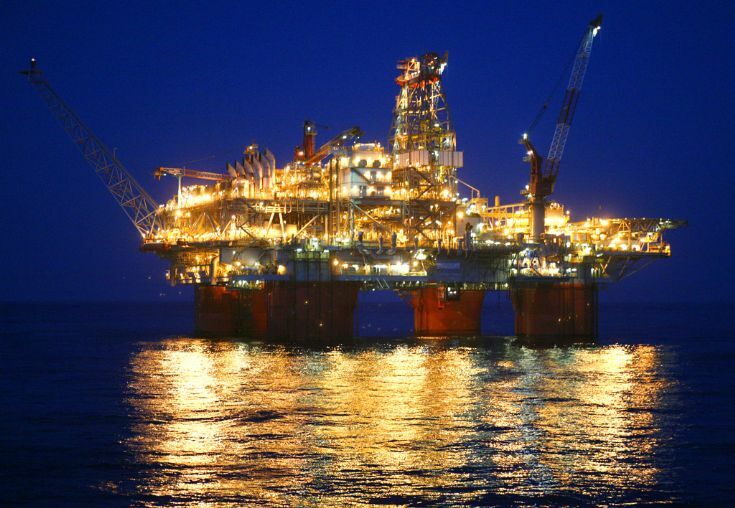 BP is the operator of this development, with Shell a major partner. 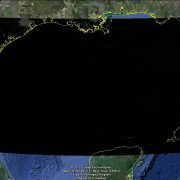 Location of fire reported last night in Gulf of Mexico. Subscribe to SkyTruth Alerts (it’s free!) and you’ll know it when we know it. Before this month, the last time the NRC received any report coming from Taylor Energy’s chronically leaking platform 23051 was July 21. Well, after a long absence, we started seeing NRC reports again starting on September 1 and since then, someone’s been reporting on that leak on an almost daily basis. And, as before, it seems as though the reporting is consistently inconsistent. 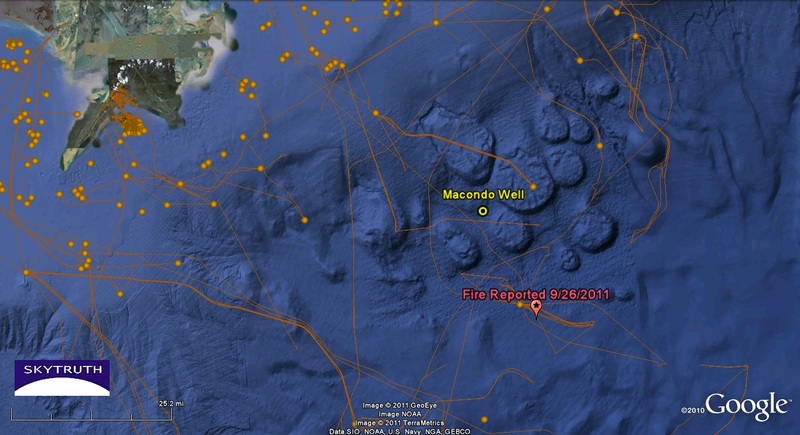 We’ve been tracking this platform since we discovered it to be leaking during the aftermath of last year’s BP Deepwater Horizon explosion, and we’ve compiled everything we have on this chronology. And we’re updating it daily. And things still don’t seem to add up right. For example, let’s look at September 18, when the NRC received a report that 1 gallon of crude oil was spilled, resulting in a slick that was .19 miles by 2.1 miles. If that slick was continuous, and it was completely covered in oil, on average 1 micron thick, our analysis shows that, in reality, there were 272.13 gallons of oil spilled. How about on September 14, when the NRC report showed that there was a spill of 43 gallons with a slick that was .25 miles by 13.6 miles. Using the calculations above, our analysis shows that the true amount of oil spilled for that incident would be 2291 gallons. Seeing a pattern of inconsistent reporting? Take a look at this satellite image of 23051 from that same day. 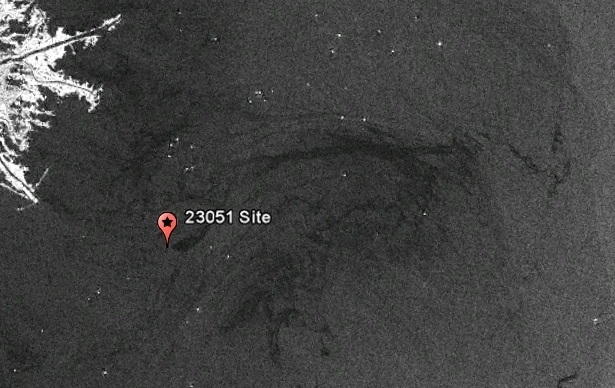 Radar satellite image of the 23051 site taken September 14, 2011. The bright white area in the upper left is the Mississippi delta. 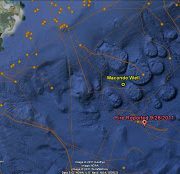 Bright white points are ships and drilling platforms. 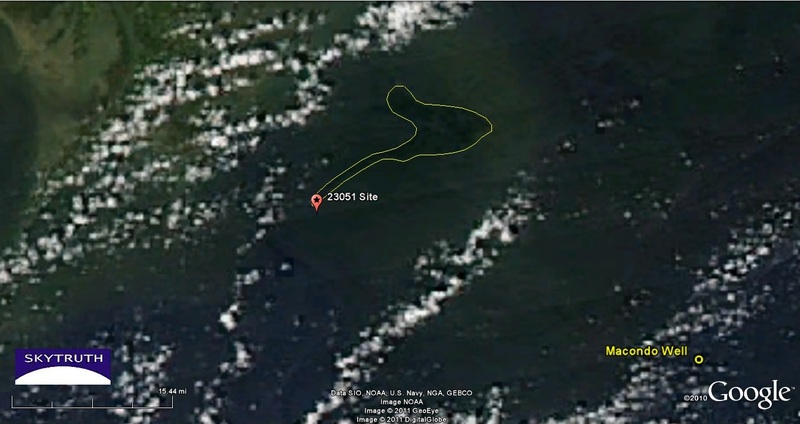 The dark area swirling out to the right of the 23015 site is the oil slick. 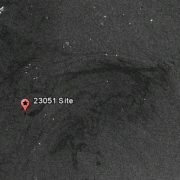 In fact, take a look at all of the NRC reports associated with site 23051 , and you’ll see that the inconsistencies are, well, rather consistent. 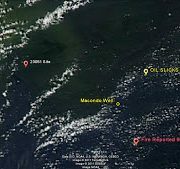 I just did a quick calculation on the reports so far this month, and for the incidents where a reported amount was given, the reported volumes range from 22 times lower to as much as 272 times lower than our calculations based on the reported size of the oil slick. On average for those reports, the reported amounts spilled are 78 times lower than our calculations.